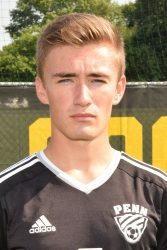 Nathan Ludwig is a senior captain who plays outside back for the Penn boys soccer team. Ludwig said when he was younger, he played many sports, including golf, football, and baseball. But none of those really stuck with him. He first got into soccer when he was nine years old because a friend had played on a soccer team and had recommended that he give soccer a shot. “I fell in love with the sport and continue to play it to this day,” Ludwig said. Ludwig is a left back for the Kingsmen. He has emerged as a Senior Leader for the Kingsmen. Ludwig lives up to his words. “Nate is a very hard working player and team leader and he gives 100 percent every game and every practice,” Karamitsos. And as for the state tournament, Ludwig said that every single person on the team has so much talent that when they come together as a team they have the potential to be very deadly on the field. Penn heads into the state tournament with an unbeaten streak of seven games, including ties against two Top 10 Teams, No. 2 Zionsville and No. 7 Goshen. Ludwig has been a key reason for the momentum surge, and is confident that the Kingsmen are ready for the state tournament.